Hope everyone’s having a good Labor Day weekend. 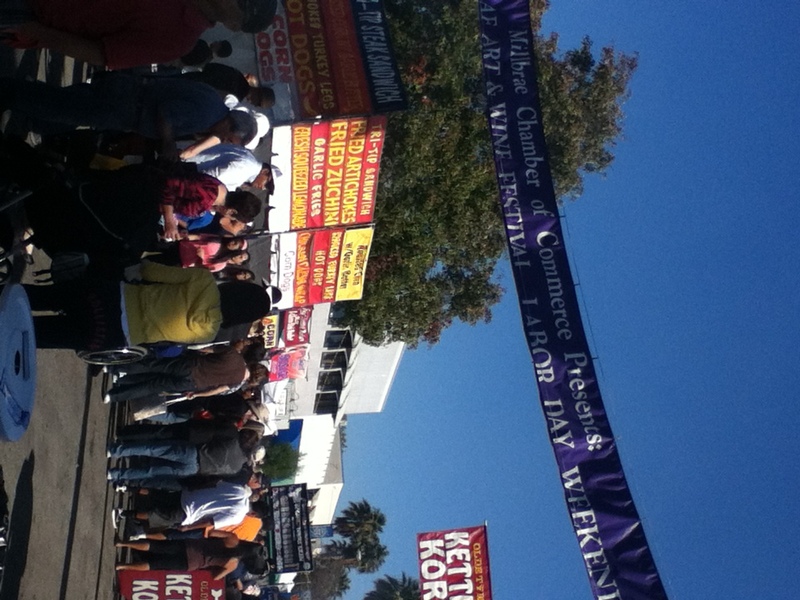 Yesterday was spent at the Millbrae Art & Wine Festival. Typical festival with lots of vendor booths selling various merchandise and services (surprisingly very little art considering “Art” is in the festival’s name), entertainment, kids play area, and tokens for beer and wine. Nice that you could walk around freely with your beer and wine through the blocks instead of being penned into a “garden” as is often the case in San Francisco festivals. It was SUPER crowded though and the moms and dads with their strollers, sometimes double strollers, were not making it any easier to navigate the crowds. Can’t blame them though for coming out to enjoy the festival and the sun. After all, festivals are meant for families. Here’s hoping that by this time next year, there will be many more people in the labor force who needs a break from working!